The use of canine hydrotherapy has increased in popularity in recent years for rehabilitation, management of musculoskeletal conditions and fitness. However much of the knowledge within the industry is based on anecdotal evidence extrapolated from research within humans and equids. Research that has been conducted within dogs (Canis lupus familiaris) focused on the efficacy of hydrotherapy as a rehabilitation tool, with little research into its effect on physiological parameters, such as heart rate (HR). Furthermore, research that has examined the effect of the aquatic environment on HR has focused on swimming, however due to the differences between swimming and the underwater treadmill (UWTM) the research cannot be accurately applied. Additionally, the UWTM offers a much more controlled environment, where variables such as water depth and speed can impact on HR. Research within humans and horses has found that speed does have an effect on HR, however due to differences in locomotion between bipeds and quadrupeds, and differences in HR responses to water temperature between these species and dogs, the information can again not be accurately applied. The aim of the present study was to determine the effect of different treadmill speeds on canine HR, whilst walking on an UWTM. This aim was achieved by measuring the HR of six acclimatised dogs during six 150 second trials in a randomised order at six different speeds, whilst submerged to mid femur, between the femoraltibial joint and greater trochanter. Each 150 second trial was conducted at a different speed: comfortable walk (CW), comfortable trot (CT), and 20% above and below these comfortable values. HR (bpm) was recorded every five seconds and underwent strict data analysis to remove erroneous data prior to statistical analysis. A significant increase (p<0.05) in HR was found as speed increased from comfortable walk up to 20% below comfortable trot. However no significant difference was found between a speed 20% below comfortable trot and comfortable trot, or comfortable trot and 20% above comfortable trot. These results are similar to those in dogs on land treadmills and horses on the UWTM, increasing the reliability. Nevertheless, additional research is needed to further increase scientific knowledge and understanding of the effect of speed of the UWTM on HR. Therefore the current study can provide preliminary data for future research, as well as provide scientific data that, when combined with previous literature, can aid canine hydrotherapists in choosing an appropriate speed for patients when designing individual treatment plans. The aquatic environment has multiple properties such as hydrostatic pressure, buoyancy, and resistance (viscosity) that offer many beneficial effects to the body whilst exercising. Such benefits include increased muscle tone and reduced blood pressure and weight bearing, compared to exercise on land (Lindley and Watson, 2010; Prankel, 2008; Millis, Levine and Taylor, 2004). These properties have been well utilised for many years within human physiotherapy (Marcellin-Little, Levine and Millis, 2015; Millis, 2005), and have become an increasingly popular tool for rehabilitation, management of musculoskeletal conditions, and general fitness in dogs (Canis lupus familiaris) (Marcellin-Little, Levine and Millis, 2015; Chauvet et al, 2011; Formenton, 2011; Waining, Young and Williams, 2011). Evidence based research for canine hydrotherapy is lacking, with much of the knowledge within the industry supported by anecdotal evidence from human and, more recently, equine research (Waining, Young and Williams, 2011). The limited research conducted within canine hydrotherapy focuses on its use in rehabilitation, for example, osteoarthritis and management of cranial cruciate ligament injuries (Nganvongpanit et al, 2014a; Wucherer et al, 2013; Monk et al, 2006; Owen, 2006). However, little research has been conducted into its effects on physiological parameters such as heart rate (HR), yet it can provide a useful indication of the metabolic and cardiovascular intensity during exercise (Essner et al, 2013; Nankervis, Thomas and Marlin, 2009; Rovira, Munoz and Benito, 2008). Some researchers have investigated the effect of dog size and water temperature on HR in dogs whilst swimming (Nganvongpanit et al, 2014b; Nganvongpanit et al, 2011). Nonetheless, the research cannot be applied to underwater treadmill (UWTM) exercise due to biomechanical differences between the two environments. For instance, when swimming dogs are completely submerged, therefore buoyancy has a greater effect, resulting in complete non weight bearing exercise. However in the treadmill the percentage weight borne can be controlled depending on the water depth (Levine et al, 2010; Owen, 2006). Consequently, the UWTM offers a much more controlled environment compared to the pool, with variables such as depth and speed easily controlled, both of which have been shown to affect HR (Nganvongpanit et al, 2014a; Nganvongpanit et al, 2014b; Nganvongpanit et al, 2011; Voss, Mohr and Krzywanek, 2002). Research within horses and humans has found that HR increases when the speed of the UWTM increases (Benelli et al, 2014; Lindner, Waschle and Sasse, 2012; Voss, Mohr and Krzywanek, 2002; Shono et al, 2000). However, due to differences between species, such as bipedal versus quadrupedal locomotion, and HR response to water temperature, any research from horses and humans cannot be accurately applied to dogs (Nganvongpanit et al, 2014b; Nankervis, Thomas and Marlin, 2009). Similar results have been found within Beagles and Labrador Retrievers when exercised at various speeds on land treadmills (Piccione et al, 2012; Ferasin and Marcora, 2009). However, due to the differences between land and aquatic exercise (buoyancy and viscosity), the results cannot be generalised between the two environments. To the author’s knowledge, no scientific studies have been performed to ascertain the effect of speed on canine HR whilst in a controlled aquatic environment such as the UWTM. Therefore, further research is required in order to fully understand the physiological effects (Nganvongpanit et al, 2011; Waining, Young and Williams, 2011). Such information has the potential to provide useful scientific evidence that could be utilised by canine hydrotherapists when designing treatment plans for individual dogs, be it for rehabilitation, management of musculoskeletal conditions, or just for fun and fitness. To measure the heart rate of six dogs using a Polar Heart Rate Sensor H1 whilst submerged in water on the underwater treadmill. To conduct six 150 second trials, each at a different speed on all six dogs, whilst measuring heart rate. To perform two repeats in order to increase reliability. Null Hypothesis: speed of the underwater treadmill will have no effect on heart rate. Alternative Hypothesis: speed of the underwater treadmill will have an effect on heart rate. Research took place at Cotswold Dog Spa (Hartpury College, Gloucester, GL19 3BE) under the supervision of a National Association of Registered Canine Hydrotherapists (NARCH) registered canine hydrotherapist, and received ethical approval from Hartpury College. Six dogs (4 Dobermans and 2 Labrador Retrievers) with a mean age of 3.3 ± 1.70 years, mean weight of 32.62 ± 5.10 kg, mean forelimb height of 61.67 ± 6.20 cm and mean hindlimb height of 56.83 ± 4.21 cm were used in the study. Under The Veterinary Surgery (Exemptions) Act (1962), all dog participants had a veterinarian report signed by their veterinarian confirming that they were eligible for canine hydrotherapy. This ensured all participants were healthy, and free from any contraindications to the use of hydrotherapy. A completed consent form was completed by all owners, ensuring that they were fully informed on the study’s design, their right to withdraw, and the secure storage of data (RCVS and BVA, 2013; Data Protection Act, 1998). Prior to commencing data collection, a pilot study was implemented to ensure that all equipment was functional and to test the methodology to be used. Each dog was required to undergo three acclimatisation sessions on the underwater treadmill (UWTM) prior to inclusion in the study. This was to get them comfortable with the UWTM whilst wearing the heart rate monitor, harness, and reflective markers; establish their comfortable walk and trot speeds; and reduce the effect of stress on heart rate (HR) (Nganvongpanit et al, 2011; Nankervis and Williams, 2006). This ensured that all dogs and owners remained free from suffering and distress for the duration of the study (RCVS and BVA, 2013; Animal Welfare Act, 2006). Following successful completion of acclimatisation, hydrotherapy sessions began with the fitting of the Polar Heart Rate Sensor H1 (Polar Electro Oy) (Figure 1). This consisted of an electrode belt with a transmitter that was strapped around the chest of the dog, with the transmitter placed ventrally, and the electrodes positioned on either side of the sternum (Essner et al, 2013). Ultrasound gel was applied to the electrode belt to promote conductivity and was secured with elastic cohesive bandage to maintain conductivity by preventing water from removing the gel (Jonckheer-Sheehy, Vinke and Ortolani, 2012) (Figure 1). Dogs were then fitted with a Ruffwear Webmaster safety harness (Ruffwear, Co Durham, UK), over which a layer of the same piece of elastic cohesive bandage was wrapped in order to further secure the electrode belt around the chest and prevent it moving caudally during the session. The transmitter was synchronised with a Polar Heart Rate Monitor S81Oi watch (Polar Electro Oy), which was strapped to the Ruffwear Webmaster harness (Figure 1). 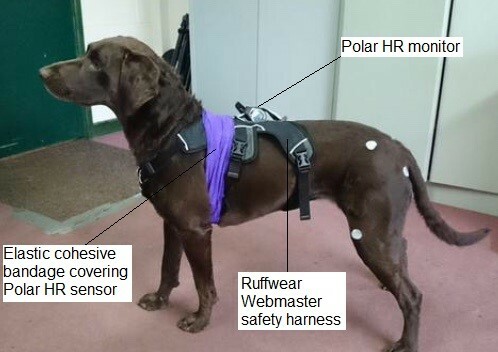 Figure 1: Dog fitted with Polar HR sensor, harness, and Polar HR monitor. Polar HR sensor was secured with purple elastic cohesive bandage. Once dogs were fitted with the equipment they were weighed (kg), their forelimb height (cm) measured to the tip of the scapula, and their hindlimb height (cm) measured to the tip of the great trochanter by the same researcher. The dog was then walked onto the UWTM (Westcoast Hydrotherapy Water Walker, Norfolk, UK) and a standing HR (bpm) taken once water depth reached mid femur, between the femoraltibial joint and greater trochanter (Figure 2). Water bromine and pH were tested, and water temperature (°C) recorded prior to data collection in each dog, and maintained within the safe range as set by the NARCH (NARCH, 2009). A video camera (Sony® HDR-CX33DE; Sony Europe Limited, Surrey, UK) was set up 1.7m away from the treadmill and at a height of 1.4m in order to record each session and correlate with the HR data for analysis. Figure 2: Dog submerged in water to mid femur, between the femoraltibial joint and greater trochanter, whilst on the underwater treadmill. Each dog then underwent 6 x 150 second trials in a randomised order at six different speeds: comfortable walk (CW), comfortable trot (CT), and 20% above and below the comfortable values (Table 1). Each session began with a walk speed, and the comfortable values were determined by the hydrotherapist during acclimatisation sessions. A rest period occurred between each 150 second trial and lasted until the HR returned to the standing HR value. This was to allow the dogs sufficient rest time in order to minimise fatigue and its effects on subsequent HR data. Each of the six speeds and the water depth used for each dog were recorded by the same researcher, to be used during the second repeat. The second repeat occurred one week after the first session. Table 1: A table to show speed categories and the respective mean speed (± standard deviations) of all dogs. Heart rate data was recorded every five seconds by the Polar Heart Rate Monitor S81Oi watch, and transferred onto Polar ProTrainer 5 Equine Edition (Polar Electro Oy) at the end of each session. This data was then exported to Microsoft Excel for comparison with data from the video camera (Sony® HDR-CX33DE), in order to determine which HR data correlated to each of the six speed trials. Video data was also used to explain any abnormal HR readings, for example if a person entered the room or if the dog jumped whilst walking. This allowed these segments to be eliminated from the analysis. Further HR data was eliminated from analysis when the HR (bpm) remained constant over four consecutive readings (20 seconds), as this was deemed to represent a loss in conductivity rather than a biologically accurate reading. Following this, if more than 40% of the data (12 HR readings) was eliminated from a 150 second trial, the whole trial was removed from analysis as the data was deemed to be erroneous and not truly representative. Additionally, dog 5 was unwilling to complete the trial for speed 6 (20% above comfortable trot) on the second repeat, therefore this trial was aborted and eliminated from analysis. Statistical analysis was undertaken using IBM SPSS Statistics 20 (IBM UK Ltd, Hampshire, UK), with the level of significance set at p<0.05. Data was tested using a Kolomogrov-Smirnov test to determine whether it was normally distributed. A Friedman Test was implemented to test for differences in HR between the six speeds within subjects, followed by a Wilcoxon Signed Rank Test with Bonferroni correction applied (Davis, 2013; Laerd Statistics, 2013). Heart rate (HR) data was collected from six dogs during six 150 second trials at six different speeds whilst on the underwater treadmill (UWTM). This was repeated on two separate occasions at a one week interval. Heart rate data for five trials were eliminated from analysis for three of the dogs due to water removing the ultrasound gel, resulting in insufficient conductivity of the Polar Heart Rate Sensor H1. A sixth trial was eliminated from data analysis due to one dog being unwilling to complete the trial at 20% above CT. Results from the Kolmogorov-Smirnov Test showed that the HR data significantly deviated from normal distribution (p<0.05); consequently non-parametric data analysis was undertaken. The Friedman Test indicated that there was a significant difference (p<0.001) between speeds within subjects. Therefore a Wilcoxon Signed Rank Test was ran as a post hoc, which after Bonferroni correction was applied (p<0.0033), found a significant difference between all speeds, except speed 4 and speed 5 (p=0.151), and speed 5 and speed 6 (p=0.582) (Table 1). 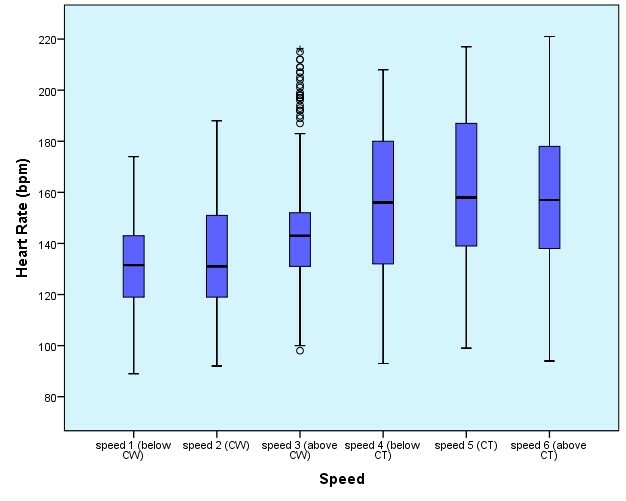 The median HR, and interquartile range for each speed was calculated (Table 2) and used to form a box plot (Figure 3). Table 2: A table to show the median heart rate and interquartile ranges of all dogs for speeds one to six. Figure 3: A box plot showing the median heart rate (bpm) of all dogs for speeds one to six. Whiskers represent 95% of the data, with outliers represented by circles. Water temperature ranged from 31-34°C, with a mean value of 31.5±0.5°C for the duration of the study. 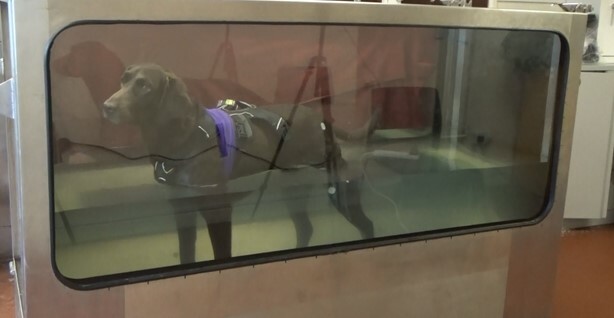 The aim of the study was to determine the effect of different treadmill speeds on canine heart rate (HR), whilst walking on an underwater treadmill (UWTM). From the results of the study the alternative hypothesis can be accepted as speed did have an effect on heart rate. The results from this study showed that there was a significant difference between all of the walk speeds, and between the walk speeds and the trot speeds. This was demonstrated by a gradual yet significant increase in HR as speed increased from speed 2 (comfortable walk) up until speed 4 (20% below CT), and a significant increase of 25.5bpm from the slowest speed 1 (20% below CW) to the fastest speed 6 (20% above CT) in median HR. Research in horses by Voss, Mohr and Krzywanek (2002) corroborates the results of the present study increasing the reliability. They found a significant difference of 18bpm between walk and trot speeds in horses on the UWTM, however, unlike the current study, only one speed was used for each gait (Voss, Mohr and Krzywanek, 2002). These results are also supported by Piccione et al (2012), who found that there was a significant increase in HR from walk to trot in dogs on a land treadmill. However, marginally slower speeds of 1.03m/s for walk and 2.01m/s for trot, were used compared to the speeds used in the current study (Table 1). Research in humans has found that greater energy is required to walk or run at a given speed in water than is required to walk or run at the same speeds on land, due to the added resistance of the water (Evans, Cureton and Purvis, 1978). As a result, it is expected that speed used during UWTM exercise would be slower than that on land in comparable gaits. Therefore, the use of slightly slower speeds by Piccione et al (2012) on land may be attributed to the difference in breeds, and therefore size of dogs compared to the current study. Furthermore, research by Blaszczyk and Dobrzecka (1989) demonstrated that individual dogs have a preferred range of speed within gaits (for example, 0.5-1.5 m/s walk and 1.2-3.1m/s trot), which is determined by hindlimb length and swing phase velocity, in order to minimise energy expenditure during long distance locomotion (Blaszczyk, 2001; Blaszczyk and Dobrzecka, 1989). It has also been found that animals typically transition between walk and trot gaits at a similar Froude number (0.3-0.5) (Starke et al, 2009), and that this transition also occurs during a preferred speed range within individuals (for example, 0.8-1.2m/s for walk to trot transition) (Blaszczyk and Dobrzecka, 1989). Hoyt and Taylor (1981) demonstrated in horses that transitioning between gaits occurs when the rate of oxygen consumption (energy expenditure) is the same in the two gaits, and that this transition required more energy than to maintain a gait. Research in dogs also found that the transition is abrupt, occurring over one stride cycle, and started with a momentary increase in hindlimb amplitude, with the initial transitional step being larger than the later steps (Blaszczyk, 2001; Blaszczyk and Dobrzecka, 1989). It is therefore reasonable to assume that the increased energy occurring during transition may be reflected by a peak in HR, for example when starting the UWTM belt, and getting the dogs up to trot speeds. Therefore future research may need to take this into consideration, as well as further explore the effect of water on this transition. Furthermore, Hoyt and Taylor (1981) demonstrated that maintaining a gait outside of the individual’s preferred speed range required more energy than if the horses were performing the preferred gait at the same speed. For example, energy expenditure (rate of oxygen consumption) was greater when trotting at 1.25m/s than walking at 1.25m/s (Hoyt and Taylor, 1981). However, in the current study, comfortable trot and walk speeds were used, as determined by the hydrotherapist, for each individual dog. Nevertheless, the speeds calculated at 20% below and above this value may have been outside or within their preferred speed range, possibly acting as a confounding variable on HR. Therefore further research would be needed to explore the effect of individual preferred speed ranges within an aquatic environment, and any possible implications on canine hydrotherapy. The current study also found that there was no significant difference between the comfortable trot and both 20% above and below it. This result is similar to Ferasin and Marcora (2009) who found that at incremental speed increases during land treadmill exercise, HR only significantly increased after the first increase of 6 to 7 mph (2.68 to 3.12m/s). The speeds used during Ferasin and Marcora’s (2009) research are very similar to the mean trot speeds used during the current study (Table 1). Therefore the similarity in results and speeds used increases the reliability of the current study. Research within horses on the UWTM also found similar results, whereby HR and speed had a non-linear relationship, with a significant increase in HR only occurring after the first three, two or one speed increases. However, within this study water depth was an additional variable, and the different patterns of HR occurred in water depths at 10%, 50% and 80% of the height at the withers, respectively. Lindner, Waschle and Sasse (2012) theorised that the levelling off of HR could have been due to increased hydrostatic pressure acting on the body at the higher water levels, increasing venous return and cardiac filling, thus increasing stroke volume (Jurek and McCauley, 2009). Ferasin and Marcora (2009) made a similar suggestion, that cardiac output is expected to increase during incremental exercise, and that in these dogs a significant increase in stroke volume, rather that HR, would be expected. Although water depth remained constant in the present study, the dog’s body was sufficiently submerged for hydrostatic pressure to have an effect (Levine et al, 2010; Jurek and McCauley, 2009). Therefore, these theories may explain why the HR did not have a linear relationship with speed in the current study, as also found within the two previously mentioned studies (Lindner, Waschle and Sasse, 2012; Ferasin and Marcora, 2009). Further scientific research would be needed to confirm this however. The non-linear relationship between speed and HR found by Lindner, Waschle and Sasse (2012) may also be explained due to the increased buoyancy making vertical movement of the limb easier, and reducing exertion of the horse (Scott et al, 2010). Within the current study, dogs were submerged to between the femoraltibial joint and greater trochanter, where weight bearing is reduced by 15% (femoraltibial joint) to 62% (greater trochanter) (Levine et al, 2010). Although the water depth remained constant, the effect of buoyancy was much greater at the faster speeds upon subjective evaluation. This was particularly apparent in the Dobermans, whereby they attempted to float or abduct their limbs onto the stationary sides during 20% above comfortable trot. This behaviour has been previously reported as a breed characteristic in Dobermans by hydrotherapists (Zink and Van Dyke, 2013). Dog 5 in particular, behaved this way for the majority of the second repeat at this speed; therefore the data was removed from analysis. From this, it can be theorised that the behaviour resulted in a reduced level of exertion and subsequent reduction in HR, as they were not trotting continually for the whole trial as they were for all the other speeds. A lowered water depth at the faster trot speeds may have omitted this behaviour, and presented more representative HR data. However further research would be needed to determine the effect of speed at different water depths. Although the sample size used within the current research was relatively small, this is a common occurrence in similar studies conducted within dogs on land, and horses in the UWTM (Lindner, Waschle and Sasse, 2012; Piccione et al, 2012; Voss, Mohr and Krzywanek, 2002). Additionally, only two breeds of dogs were used (Dobermans and Labrador Retrievers), both of which are of similar weights and heights, and mesomorphic and mesocephalic (Zink, 2004). This strengthens the internal validity of the research, by restricting the effect of extraneous variables such as dog size on HR data (Hezzell et al, 2013; Nganvongpanit et al, 2011). Whilst also increasing the external validity of the results to these two breeds, it consequently reduces the generalisability to breeds outside of the sample population. Conversely, the sample population was female dominant, with only one male. Nganvongpanit et al (2011) reported that females had a significantly higher HR than males during aquatic swimming. Although measuring the effect of gender on HR was not within the scope of this study, it nevertheless presents an uncontrolled extraneous variable that could be further researched using a larger sample size with an equal gender split. Heart rate was measured using a non-invasive Polar Heart Rate Monitor, which has been demonstrated to provide reliable data within research equivalent to that recorded using ECG (Essner et al, 2013; Jonckheer-Sheehy, Vinke and Ortolani, 2012). However, in the present study, difficulty arose in maintaining conductivity due to water removing the ultrasound gel, despite being wrapped in elastic cohesive bandage. This resulted in strict data analysis to remove erroneous data so as not to impact on the validity. Alternative methods of maintaining a water tight seal need to be explored during further research in order to provide a more complete data set. Researchers have demonstrated that human-dog interactions can have a significant effect on HR. Palestrini et al (2005) noted that HR increased when dogs were left alone with a stranger, yet the presence of a stranger whilst the owner was still present had no significant effect on HR. Furthermore, Maros, Doka and Miklosi (2008) found that being petted by a stranger significantly increased HR. To reduce the effect of such variables, owners remained present during data collection, and acclimatisation sessions were undertaken prior to data collection. However, one variable that could not be controlled for was the effect of toys and treats on HR. Research has shown that when a dog is orientated towards a toy, HR and heart rate variability significantly increase, compared to similar body positions without the toy being present (Nganvongpanit et al, 2011; Maros, Doka and Miklosi, 2008). In the current study, all dogs required some form of encouragement during UWTM sessions, either from owners, food, or toys. Although this decreases the internal validity of results, it is common protocol within clinical practice and allows the dogs to enjoy their sessions and gain the full benefits of hydrotherapy (Prankel, 2008; Owen, 2006). The use of acclimatisation sessions further strengthens the validity and reliability of results, by reducing the effect of stress and excitement of a new experience on HR data. The effect that acclimatisation to land treadmills, UWTM and swimming has on HR, has been well demonstrated in research within horses and dogs (Nganvongpanit et al, 2011; Ferasin and Marcora, 2009; Nankervis and Williams, 2006). However, the number of sessions used for acclimatisation varies between the studies (2, 4 and 4 respectively) and no exact number of sessions has been determined for canine UWTM exercise (Nganvongpanit et al, 2011; Ferasin and Marcora, 2009; Nankervis and Williams, 2006). Nganvongpanit et al (2014b) and Nankervis, Thomas and Marlin (2009) demonstrated the effect that water temperature can have on HR in dogs and horses. Water temperature remained within the safe range set by the NARCH, with a mean temperature of 31.5±0.5°C recorded for the duration of the study, therefore controlling the effect of this extraneous variable (NARCH, 2009). To further increase the reliability of the study, the order of speeds was randomised to reduce order effects (Gray and Kinnear, 2012). Additionally, the same researcher measured forelimb and hindlimb height, water depth, and controlled the speed of the UWTM for all participants to reduce inter-operator variability. To the author’s knowledge, this is one of the first studies to investigate the effect of speed on HR whilst on the UWTM, therefore the results can provide useful scientific data for canine hydrotherapists in choosing an appropriate speed when designing treatment plans for patients. The results found a significantly higher HR during trot speeds than at walk speeds, which when coupled with similar results from research in dogs on land treadmills, demonstrates the benefit of faster speeds on cardiovascular fitness, and can be utilised within healthy athletic dogs (Ferasin and Marcora, 2009; Jurek and McCauley, 2009). However, as no significant difference was found between comfortable trot (CT) and 20% below and above, it could be suggested that use of CT would be more effective at increasing exertion during fitness sessions, particularly in dogs that float or abduct their limbs. Additionally, the slower walking speeds demonstrated significantly lower HR compared to trot, and therefore possibly a lower energy expenditure, which may be more suitable to conservative or post-operative rehabilitation so as not to induce fatigue, whilst also providing a supportive environment for increased muscle strength and reduced weight bearing forces on joints compared to on land exercise (Monk et al, 2006; Levine et al, 2010). Furthermore, it demonstrates the use of the UWTM as a weight loss tool when reviewed in conjunction with results from Wucherer et al (2013) and Chauvet et al (2011). Choosing a comfortable speed whilst in the aquatic environment provides added resistance to increase muscle activity, whilst again reducing the impact of heavy weight bearing forces on joints in over weight dogs (Chauvet et al, 2011; Levine et al, 2010; Millis, 2005). Within the current study water depth remained constant between the femoraltibial joint and greater trochanter. This was to increase the external validity and application of results to clinical practice, as it is a common depth used within rehabilitation due to the increased support and greater reduction in weight bearing than at lower water depths (Levine et al, 2010; Prankel, 2008; Owen, 2006). Research in horses and humans however, has demonstrated the effect of depth on HR (Benelli et al, 2014; Lindner, Waschle and Sasse, 2012). Therefore the effect of different depths at different speeds needs to be researched to increase scientific knowledge and understanding in canine hydrotherapy. The results can be compared to research in dogs on land treadmills to assess the difference between land and UWTM exercise. However, methodological differences in breed, gender, and speed provide extraneous variables that can impact on HR, as well as the impact of variation between individuals (Piccione et al, 2012; Nganvongpanit et al, 2011; Ferasin and Marcora, 2009). Although in the present study the validity of results is increased as each dog served as its own control between speeds, no dry controls were performed to determine the effect of water on HR at each speed. Therefore further research could be conducted using a repeated measures design to assess the effect of UWTM exercise at various speeds compared to land treadmill exercise at the same speeds providing further evidence as to whether aquatic exercise offers comparable or greater energy expenditure to exercise on land. Despite results being similar to that found within horses (Lindner, Waschle and Sasse, 2012; Voss, Mohr and Krzywanek, 2002), key differences in methodology between species, such as the water temperature used, provide variables that limit its application to canine hydrotherapy (Nganvongpanit et al, 2014b ; Nankervis, Thomas and Marlin, 2009). Furthermore, the results found in the present study differ from the linear relationship found between speed and HR in human UWTM research (Benelli et al, 2013; Shono et al, 2000); highlighting the need to further explore scientific research within canine hydrotherapy. The results from the present study found that speed of the underwater treadmill (UWTM) did have an effect on canine HR, with a gradual yet significant increase in HR as speed increased from comfortable walk up to 20% below comfortable trot. However, no significant difference was found between comfortable trot and both 20% above and below. These results corroborate to a degree with research in dogs on land treadmills and horses on the UWTM. This may be explained by an increase in venous return and cardiac filling due to hydrostatic pressure, resulting in an increased stroke volume, not HR, at increased exertion levels. However based on subjective evaluation, the effect of buoyancy seemed increased at faster trot speeds, during which, dogs attempted to float and abduct their limbs. This may have resulted in a reduced energy expenditure, providing HR data that was not truly representative of the speed should they have performed a trot continually for the duration of the trial. This behaviour may have been omitted at lower water depths, however further research into the effect of water depth on HR and hydrostatic pressure on stroke volume are needed to confirm this. The research sample used consisted of two breeds that are similar in height and weight, as well as both being mesomorphic and mesocephalic; strengthening the internal validity of the research. However, the sample size was small and gender biased towards females. Moreover, no dry controls were conducted to determine the effect of water on HR at each speed within subjects. Therefore the current study provides preliminary data for future research within canine hydrotherapy using a larger sample size with equal gender distribution. Furthermore, when combined with previous literature, this research can provide useful scientific data to aid canine hydrotherapists in appropriate choice of speed when designing treatment plans for patients. Animal Welfare Act 2006 [online]. Chapter 45. (2006) legislation.gov.uk. Available from: http://www.legislation.gov.uk/ukpga/2006/45/contents [Accessed 01 October 2014]. Benelli, P., Colasanti, F., Ditroilo, M., Cuesta-Vargas, A., Gatta, G., Giacomini, F. and Lucertini, F. (2014) Journal of Sports Sciences [online]. 32 (3), pp. 268-277. [Accessed 06 October 2014]. Blaszczyk, J. (2001) Gait transitions during unrestrained locomotion in dogs. Equine Veterinary Journal [online]. 33, pp.112-112. [Accessed 13 March 2015]. Blaszczyk, J. and Dobrzecka, C. (1989) Speed control in quadrupedal locomotion: Principles of limb coordination in the dog. Acta Neurobiologiae Experimentalis [online]. 49, pp.105-124. [Accessed 13 March 2015]. Chauvet, A., Laclair, J., Elliot, D. and German, A. (2011) Incorporation of exercise, using an underwater treadmill, and active client education into a weight management program for obese dogs. Canadian Veterinary Journal [online]. 52, pp. 491-496. [Accessed 30 September 2014]. Data Protection Act 1998 [online]. Chapter 29. (1998) legislation.gov.uk. Available from: http://www.legislation.gov.uk/ukpga/1998/29 [Accessed 01 October 2014]. Davis, C. (2013) SPSS for Applied Sciences: basic statistical testing. Australia: CSIRO Publishing. Essner, A., Sjostrom, R., Ahlgren, E. and Lindmark, B. (2013) Validity and reliability of Polar RS800CX heart rate monitor, measuring heart rate in dogs during standing position and at trot on a treadmill. Physiology and Behaviour [online]. 114-115, pp. 1-5. [Accessed 30 September 2014]. Evans, B., Cureton, K. and Purvis, J. (1978) Metabolic and Circulatory Responses to Walking and Jogging in Water. Research Quarterly [online]. 49 (4), pp. 442-449. [Accessed 13 March 2015]. Ferasin, L. and Marcora, S.(2009) Reliability of an incremental exercise test to evaluate acute blood lactate, heart rate and body temperature responses in Labrador retrievers. Journal of Comparative Physiology B [online]. 179, pp. 839-845. [Accessed 27 September 2014]. Formenton, M. (2011) Physical therapy in dogs: applications and benefits. Veterinary Focus [online]. 21 (2). [Accessed 30 September 2014]. Gray, C. and Kinnear, P. (2012) IBM SPSS Statistics 19 Made Simple. New York: Psychology Press. Hezzell, M., Humm, K., Dennis, S., Agee, L. and Boswood, A. (2013) Relationship between heart rate and age, bodyweight and breed in 10,849 dogs. Journal of Small Animal Practice [online]. 52, pp. 318-324. [Accessed 10 October 2014]. Hoyt, D. and Taylor, C. (1981) Gait and the energetics of locomotion in horses. Nature [online]. 292, pp. 239-240. [Accessed 13 March 2015]. Jonckheer-Sheehy, V.S.M., Vinke, C.M. and Ortolani, A. (2012) Validation of a polar® human heart rate monitor for measuring heart rate and heart rate variability in adult dogs under stationary conditions. Journal of Veterinary Behaviour [online]. 7, pp. 205-212. [Accessed 02 February 2015]. Jurek, C. and McCauley, L. (2009) Underwater Treadmill Therapy in Veterinary Practice: Benefits and Considerations. Veterinary Medicine [online]. [Accessed 03 March 2015]. Laerd Statistics (2013) SPSS Tutorials and Statistical Guides. Available from: https://statistics.laerd.com/aboutus.php [Accessed 11 October 2014]. Levine, D., Marcellin-Little, D. and Millis, D. (2010) Effects of partial immersion in water on vertical ground reaction forces and weight distribution in dogs. American Journal of Veterinary Research [online]. 71 (12), pp. 1413-1416. [Accessed 15 October 2014]. Lindner, A., Waschle, S. and Sasse, H. (2012) Physiological and blood biochemical variables in horses exercising on a treadmill submerged in water. Animal Physiology and Animal Nutrition [online]. 96, pp. 563-569. [Accessed 06 October 2014]. Lindley, S. and Watson, P. (2010) BSAVA Manual of Canine and Feline Rehabilitation, Supportive and Palliative Care: Case Studies in Patient Management. British Small Animal Veterinary Association: Gloucester. Marcellin-Little, D., Levine, D. and Millis, D. (2015) Rehabilitation and Physical Therapy [online]. Pennsylvania: Elsevier Inc. [Accessed 03 March 2015]. Maros, K., Dóka, A. and Miklósi, A. (2008) Behavioural correlation of heart rate changes in family dogs. Applied Animal Behaviour Science [online]. 109, pp. 329-341. [Accessed 01 February 2015]. Millis, D. (2005) Physical Rehabilitation: Improving the outcome in dogs with orthopaedic problems. Veterinary Medicine [online]. [Accessed 05 March 2015]. Millis, D., Levine, D. and Taylor, R. (2004) Canine Rehabilitation and Physical Therapy. Saunders: Missouri. Monk, M., Preston, C. and McGowan, C. (2006) Effects of early intensive postoperative physiotherapy on limb function after tibial plateau levelling osteotomy in dogs with deficiency of the cranial cruciate ligament. American Journal of Veterinary Research [online]. 67. [Accessed 28 October 2014]. Nankervis, K., Thomas, S. and Marlin, D. (2009) Effect of water temperature on heart rate on horses during water treadmill exercise. Comparative Exercise Physiology [online]. 5 (3-4), pp. 127-131. [Accessed 01 October 2014]. Nankervis, K. and Williams, R. (2006) Heart rate responses during acclimation of horses to water treadmill exercise. Equine Veterinary Journal [online]. 36, pp. 110-112. [Accessed 27 September 2014]. National Association of Registered Canine Hydrotherapists (2009) Guidelines for safe water levels and ranges [online]. National Association of Registered Canine Hydrotherapists. Available from: http://www.narch.org.uk/assets/resources/Water%20quality%20guidelines.pdf [Accessed 01 October 2014]. Nganvongpanit, K., Kongsawasdi, S., Chuatrakoon, B. and Yano, T. (2011) Heart rate change during aquatic exercise in small, medium and large healthy dogs. The Thai Journal of Veterinary Medicine [online]. 41 (4), pp. 455-461. [Accessed 29 September 2014]. Nganvongpanit, K., Tanvisut, S., Yano, T. and Kongtawelert, P. (2014a) Effect of swimming on clinical functional parameters and serum biomarkers in healthy and osteoarthritic dogs. IRSN Veterinary Science [online]. [Accessed 27 September 2014]. Nganvongpanit, K., Boonchai, T., Taothong, O. and Sathanawongs, A. (2014b) Physiological effects of water temperatures in swimming toy breed dogs. Kafkas Universitesi Veteriner Fakultesi Dergisi [online]. 20 (2), pp.177. [Accessed 10 October 2014]. Owen, M. (2006) Rehabilitation therapies for musculoskeletal and spinal disease in small animal practice. European Journal of Companion Animal Practice [online]. 16 (2). [Accessed 05 October 2014]. Palestrini, C., Previde, E.P., Spiezio, C. and Verga, M. (2005) Heart rate and behavioural responses of dogs in the ainsworth’s strange situation: a pilot study. Applied Animal Behaviour Science [online]. 94, pp. 75-88. [Accessed 04 February 2015]. Piccione, G., Casella, S., Panzer, M., Giannetto, C. and Fazio, F. (2012) Effect of moderate treadmill exercise on some physiological parameters in untrained beagle dogs. Experimental Animals [online]. 6 (15), pp. 511-515. [Accessed 08 October 2014]. Prankel, S. (2008) Hydrotherapy in Practice. In Practice [online]. 30, pp. 272-277. [Accessed 05 March 2014]. Rovira, S., Munoz, A. and Benito, M. (2008) Effect of exercise on physiological, blood and endocrine parameters in search and rescue-trained dogs. Veterinarni Medicina [online]. 53 (6), pp. 333-346. [Accessed 28 September 2014]. Royal College of Veterinary Surgeons and British Veterinary Association (2013) Ethical Review for Practice-based Research [online]. Royal College of Veterinary Surgeons. Available from: http://www.rcvs.org.uk/publications/ethical-review-for-practice-based-research/ [Accessed 01 October 2014]. Scott, R., Nankervis, K., Stringer, C., Westcott, K. and Marlin, D. (2010) The effect of water height on stride frequency, stride length and heart rate during water treadmill exercise. Equine Veterinary Journal [online]. 42 (38), pp. 662-664. [Accessed 04 November 2014]. Shono, T., Fujisjima, K., Hotta, N., Ogaki, T., Ueda, T., Otoki, K., Teramoto, K. and Shimizu, T. (2000) Physiological response and RPE during underwater treadmill walking in women of middle and advanced age. Journal of Physiological Anthropology and Applied Human Science [online]. 19 (4), pp. 195-200. [Accesed 05 October 2014]. Starke, S., Robilliard, J., Weller, R., Wilson, A. and Pfau, T. (2009) Walk-run classification of symmetrical gaits in the horse: a multidimensional approach. Journal of the Royal Society Interface [online]. 6, pp.335-342. [Accessed 13 March 2015]. The Veterinary Surgery (Exemptions) Act 1962 [online]. Legislation.gov.uk. Available from: http://www.legislation.gov.uk/uksi/1962/2557/pdfs/uksi_19622557_en.pdf [Accessed 01 October 2014]. Voss, B., Mohr, E. and Krzywanek, H. (2002) Effects of aqua-treadmill exercise on selected blood parameters and on heart rate variability of horses. Journal of Veterinary Medicine [online]. 49, pp. 137-143. [Accessed 29 September 2014]. Waining, M., Young, I. and Williams, S. (2011) Evaluation of the status of canine hydrotherapy in the UK. Veterinary Record [online]. 186 (15). [Accessed 28 September 2014]. Wucherer, K.L., Conzemius, M.G., Evans, R. and Wilke, V.L. (2013) Short-term and long-term outcomes for overweight dogs with cranial cruciate ligament rupture treated surgically or nonsurgically. Journal of the American Veterinary Medical Association [online]. 242 (10), pp. 1364-1372. [Accessed 06 January 2015]. Zink, C. (2004) Peak Performance Coaching the Canine Athlete [online]. 2nd ed. Maryland: Canine Sports Productions. [Accessed 10 March 2015]. Zink, C. and Van Dyke, J. (2013) Canine Sports Medicine and Rehabilitation [online]. Iowa: John Wiley and Sons. [Accessed 10 March 2015].